Pain medication abuse is affecting individuals with legitimate needs to manage chronic pain. 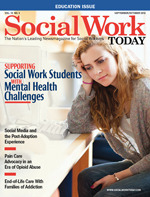 Learn how social workers can advocate for them. Prescription drugs now rank second after marijuana as the drug of choice for substance abuse, surpassing cocaine, heroin, and other illegal street drugs. Media headlines, celebrity doctors, and popular TV shows regularly denounce the “painkiller epidemic,” “prescription drug trade,” and “war on prescription painkillers.” Lost in these negative media messages, however, is the fact that the majority of these abusers were not prescribed opioids themselves but rather buy or steal them from others who were prescribed opioids for a medical condition (Manchikanti, Fellows, Ailinani, & Pampati, 2010). Prescription pain medication addiction has been referred to as a public health crisis in the media. Statistics from the National Institute on Drug Abuse (NIDA) indicate that prescription drug abuse has increased dramatically, and opioid pain medications are now abused by more than 5 million Americans, making this drug class more likely to be abused than prescription antidepressants, sedatives, or stimulants. According to NIDA statistics, 15,600 deaths in 2009 were attributable to prescription pain medications. But for individuals who legitimately require and benefit from opioids, the undertreatment of chronic long-term pain is a problem unrecognized even by those in healthcare due to the focus on opioid abuse. “The media generally does not report the issues around opioid use with accuracy, neutrality, and critical thinking. The tide has shifted from demonizing pain medication to demonizing people with pain, continuing the suffering of millions with untreated or undertreated pain,” says Yvette Colón, PhD, MSW, a psychosocial specialist at The MetaCancer Foundation. “Unfortunately, this research coincided with increased rates of prescription pain medication abuse and media attention to it,” says Deborah Barrett, PhD, MSW, LCSW, a clinical associate professor at the University of North Carolina at Chapel Hill School of Social Work, a private practice psychotherapist, and the author of Paintracking: Your Personal Guide to Living Well With Chronic Pain. Barrett sees the issue from both the social worker and the patient perspective: She has lived with the chronic pain of fibromyalgia for almost 20 years. Prescribing opioids responsibly is a tricky balance since every patient and his or her pain is unique. In addition to being evaluated for symptoms and the potential for adverse side effects, pain sufferers must be evaluated for substance abuse potential, Barrett says. As a result of media attention on increasing rates of prescription pain medication abuse, those with chronic pain who had previously found improved functioning, psychological health, and quality of life with appropriate opioid use began to face increased difficulties receiving effective treatment. For the last few years, social workers involved in pain management have been seeing their patients and clients endure the effects of this antiopioid sentiment and are experiencing challenges in advocating for those living with chronic pain. Health insurers may have stopped covering opioids, providers stopped writing prescriptions, and/or pharmacies did not stock the medications. “The glimmer of hope that they had experienced for managing their pain and participating more fully in society was extinguished,” Colón says. Efforts intended to address opioid abuse have adversely affected quality of life for those with chronic pain. The growing fear and stigma linked to opioid use have led to unintended consequences for patients with chronic pain who could appropriately use opioids with substantial overall benefit. “Policy, healthcare payer rulings, and professional behaviors in response to antiopioid media coverage continue to erode access to effective pain management for those who suffer from chronic pain,” Colón says. So much misunderstanding about opioid pain medications has been generated by the negative media focus, healthcare providers, patients, family caregivers, and community members, according to Shirley Otis-Green, MSW, ACSW, LCSW, OSW-C, senior research specialist in nursing research and education at City of Hope, a Comprehensive Cancer Center in Duarte, CA, and coeditor of the Oxford Textbook of Palliative Social Work. She has been involved in national research and education programs on state-of-the-art pain management as a component of palliative cancer care. “Patients receive mixed messages about prescribed opioids … that they are needed for effective pain relief, yet they should ‘just say no’ to drugs,” she explains. Family caregivers may have misconceptions and fears about loved ones using strong medications and express concerns about dependence or addiction. The resulting layers of guilt and confusion can circumvent even the best pain management strategies, she says. Among healthcare practitioners, there is enormous fluctuation in clinical perspectives on opioid prescription, Otis-Green notes. “Some are not comfortable prescribing an opioid for joint pain but will prescribe one for cancer pain. Others will not even prescribe opioids at all until they perceive the patient is in the last days of life,” she explains. At one point, Otis-Green was involved in state and national movements to advocate for more informed palliative pain care to better meet the needs of cancer patients. “It was a huge effort just to get pain management guidelines for this patient group,” she says. Recently published studies report that misconceptions remain, and palliative pain management is often suboptimal despite new guidelines for end-of-life pain care (Gardiner, Gott, Ingleton, Hughes, Winslow, & Bennett, 2012; Shaheen et al., 2010). For patients with chronic noncancer pain, opioid prescription remains highly controversial, and even in the wake of prescription guidelines and educational efforts, primary care physicians continue to practice under misconceptions about appropriate opioid use vs. addiction, leading to patient undertreatment (Wolfert, Gilson, Dahl, & Cleary, 2010; Hooten & Bruce, 2011). Surveys of physician knowledge about opioid prescriptions indicate that overall pain management expertise is lacking; knowledge and comfort with opioid pain management is low; medical training in appropriate opioid use is inadequate; pain management referral options are lacking; pain management reimbursement is limited; and concerns regarding patient addiction are common (Keller, Ashrafioun, Neumann, Van Klein, Fox, & Blondell, 2012; Barry et al., 2010). Without opioid-related issues, significant barriers to good pain care already exist, Colón says, including patients’ difficulty in communicating about symptoms of their underlying medical condition vs. pain symptoms, a lack of knowledge regarding the array of treatment options, and their doctor’s underestimation of the impact of chronic pain on quality of life. These barriers, coupled with the need to combat misconceptions about opioids and losing access to effective medications, may significantly reduce a chronic pain patient’s ability to function and subsequently contribute to the patient’s overall stress. According to Colón, escalating antiopioid sentiment has given rise to an advocacy movement among social workers, who can help those with chronic pain find validation regarding their pain and be treated with dignity and respect by doctors, nurses, and pharmacists rather than as drug-seeking addicts. Social workers are excellent and effective advocates because they know the problems and barriers faced by people with pain and their loved ones. They also have cultural skills and knowledge to understand the context in which someone deals with pain. More importantly, social workers serve on the front lines of human suffering, and they care deeply about their clients, Colón says. “Social work skills are imminently applicable to pain advocacy. Pain is a social justice issue with gender, cultural, socioeconomic, racial, psychological, and spiritual aspects, and it is a complex aspect of our clients’ lives,” says Terry Altilio, LCSW, social work coordinator in the department of pain medicine and palliative care at Beth Israel Medical Center in New York City and coeditor of the Oxford Textbook of Palliative Social Work. Altilio sees patients who cannot access pain care elsewhere and works with clinicians who are very informed regarding the varied needs of pain patients and their families. “Pain is a multidimensional experience that requires a multidimensional treatment plan,” Altilio says. Because social workers already have experience interacting in multiple dimensions, they are well suited to act as advocates and clinicians for those with chronic pain, which includes not only physical pain but also psychological, social, spiritual, and existential pain and suffering, Otis-Green says. “To be even more effective advocates for pain care, social workers need to gain a certain level of expertise and familiarity with opioid medications to be able to combat misconceptions as well as knowledge of the current research and evidence base for pain management so they can give accurate information to patients and ultimately make a positive impact on overall suffering,” she says. But social workers essentially have been absent from the specialty, Altilio says. Given the ongoing antiopioid sentiment and the increasing need for overall patient advocacy in today’s healthcare environment, the time is ripe for social workers to join pain care advocacy efforts. “Social workers need to develop and then own their expertise in pain care. We need to consider this an area that is legitimately within our scope of practice,” Otis-Green says. Treating patients and families with concerns regarding pain, pain with addiction, depression, anxiety, and other medical conditions are already in the social worker’s purview. Learning the complexities of pain care management involving opioid prescription—from medical to legal to regulatory—may be new for some social workers in pain care advocacy. Social workers may need to supplement their skills by learning the nuances of a client’s healthcare network, how to evaluate the risk of substance dependence and abuse if opioids are prescribed, and the complex array of treatment strategies for chronic pain, Barrett says. “Social workers can be more effective advocates by becoming and staying informed,” Altilio adds. In pain care advocacy, the primary challenge for social workers is understanding what to advocate for, which involves learning the intricacies of pain care management. According to Altilio, social workers will need to learn, for example, when to advocate for a successful disability application vs. rehabilitation and return to work and when to advocate for various treatment strategies, such as pharmacologic management, physical therapy, alternative medicine, or a multifaceted treatment plan. “Social workers who work with pain-related suffering need to develop related assessment skills and then treat and advocate based on that assessment,” she says. Depression and anxiety often accompany chronic pain, so the social worker’s differential diagnosis becomes essential to inform advocacy efforts, she adds. Pain care advocates also need to be informed about the current regulatory climate and risks and benefits of opioid prescriptions, she notes. “We also have the responsibility to advocate with insurers to reimburse for evidence-informed techniques that complement pharmacologic management, such as cognitive behavioral therapy, physical therapy, and acupuncture, for example,” she notes. Although pain care advocates operate in multiple healthcare dimensions, social worker advocates may do valuable one-on-one work with the patient or client. “Being knowledgeable about the barriers faced by those in chronic pain can help social workers advocate for them and also teach them to advocate for themselves for effective pain management,” Colón says. Because those with chronic pain can feel powerless, particularly when they are struggling for validation and answers, the most important service social workers can provide is helping individuals become informed consumers of their own pain care and improve communication with healthcare providers, Barrett emphasizes. In addition to helping those with chronic pain better navigate the healthcare system, social workers also can assist in coping with pain amidst antiopioid attitudes. Living with chronic pain affects every aspect of a person’s life, including sense of self; relationships (intimate, family, social); and the ability to work or function. Social workers can facilitate therapy for dealing with grief and loss from chronic pain and development of positive coping strategies. “Chronic pain challenges coping skills because there is no easy answer or one-size-fits-all therapy. Our central task is to help each client figure out and embrace the most effective changes, which comes from systematic personal experiments and confronting fears or bias about pain and treatment strategies,” Barrett says. Psychoeducation delivered by a social worker helps validate the multidimensional nature of clients’ pain and guide them in discovering and reinforcing resilience, thereby helping them better manage pain and improve quality of life, Altilio says. Colón believes social workers can provide excellent support at the micro level to individuals and families but also make a difference at the macro level in advocacy and policy in public health practice. On a macro level, social workers like Otis-Green and Colón can add the social worker perspective to pain management education and policy. Currently, Otis-Green focuses on education—how to better prepare social workers to address the overall suffering associated with pain. She helped develop the nationally recognized “Promoting Excellence in Pain Management and Palliative Care for Social Workers” annual training course (Otis-Green, Lucus, Spolum, Ferrell, & Grant, 2008). Colón has provided organizational leadership and program evaluation for and participated in research and legislative advocacy at nonprofit organizations. Given the negative consequences of rampant antiopioid media messages for patients with chronic pain who could appropriately use and benefit from opioids, opportunities exist for social workers to educate not only patients and families but also healthcare providers and community organizations. — Jennifer Van Pelt, MA, is a Reading, PA-based freelance writer and frequent contributor to Social Work Today. Proponents and opponents of opioids for chronic pain still engage in debate. Recent news reports suggest that past clinical support for expanding opioid use was heavily influenced by pharmaceutical companies and the risk of addiction in patients with chronic pain is high (Fauber, 2012). But emerging evidence suggests otherwise. A July systematic review of 17 studies involving 88,235 patients with acute and chronic pain, the majority of whom were prescribed opioids for chronic noncancer pain, concluded that opioid use for chronic pain conditions is not associated with a major risk of developing a dependence (Minozzi, Amato, & Davoli,, 2012). Addiction fears may be fueled by inappropriate use of the terms “dependence,” “tolerance,” and “addiction.” The popular medical website WebMD recently posted an article on common myths associated with pain medication use (www.webmd.com/pain-management/features/prescription-painkiller-addiction-7-myths). In this article, clinical experts in pain management explain that tolerance and dependence occur independently of addiction and can occur with many drugs, not just opioids. Healthcare providers, patients, and caregivers may confuse tolerance and dependence with addiction, leading to the discontinuation of appropriate opioid use. Also in July, the FDA finalized its risk evaluation and mitigation strategy for extended-release and long-acting opioids, which requires manufacturers to sponsor education programs about how to appropriately prescribe opioids and provide patient education materials. The FDA program has been criticized for relying on industry sponsorship and for not mandating education for prescribing physicians. The program is part of a national strategy in response to the “prescription painkiller epidemic” (Fiore, 2012). Barry, D. T., Irwin, K. S., Jones, E. S., Becker, W. C., Tetrault, J. M., Sullivan, L. E., et al. (2010). Opioids, chronic pain, and addiction in primary care. Journal of Pain, 11(12), 1442-1450. Fauber, J. (2012). Chronic pain fuels boom in opioids. Retrieved from http://www.medpagetoday.com/neurology/painmanagement/31254. Fiore, K. (2012). FDA finalizes opioid education plan. Retrieved from http://www.medpagetoday.com/publichealthpolicy/FDAGeneral/33682. Gardiner, C., Gott, M., Ingleton, C., Hughes, P., Winslow, M., & Bennett, M. I. (2012). Attitudes of healthcare professionals to opioid prescribing in end-of-life care: A qualitative focus group study. Journal of Pain Symptom Management, 44(2), 206-214. Hooten, W. M., & Bruce, B. K. (2011). Beliefs and attitudes about prescribing opioids among healthcare providers seeking continuing medical education. Journal of Opioid Management, 7(6), 417-424. Keller, C. E., Ashrafioun, L., Neumann, A. M., Van Klein, J., Fox, C. H., & Blondell, R. D. (2012). Practices, perceptions, and concerns of primary care physicians about opioid dependence associated with the treatment of chronic pain. Substance Abuse, 33(2), 103-113. Manchikanti, L., Fellows, B., Ailinani, H., & Pampati, V. (2010). Therapeutic use, abuse, and nonmedical use of opioids: A ten-year perspective. Pain Physician, 13(5), 401-435. Minozzi, S., Amato, L., & Davoli, M. (2012). Development of dependence following treatment with opioid analgesics for pain relief: A systematic review. Addiction, Epub ahead of print. Otis-Green, S., Lucas, S., Spolum, M., Ferrell, B., & Grant, M. (2008). Promoting excellence in pain management and palliative care for social workers. Journal of Social Work and End of Life Palliative Care, 4(2), 120-134. Schug, S. A., Zech, D., Grond, S., Jung, H., Meuser, T., & Stobbe, B. (1992). A long-term survey of morphine in cancer pain patients. Journal of Pain Symptom Management, 7(5), 259-266. Shaheen, P. E., Legrand, S. B., Walsh, D., Estfan, B., Davis, M. P., Lagman, R. L., et al. (2010). Errors in opioid prescribing: A prospective survey in cancer pain. Journal of Pain Symptom Management, 39(4), 702-711. Wolfert, M. Z., Gilson, A. M., Dahl, J. L., & Cleary, J. F. (2010). Opioid analgesics for pain control: Wisconsin physicians’ knowledge, beliefs, attitudes, and prescribing practices. Pain Medicine, 11(3), 425-434.